국보 제83호 금동미륵보살반가사유상(2014년 국보 동산 앱사진). 국립중앙박물관에 있는 금동미륵보살반가사유상(국보 제78호)과 함께 국내에서는 가장 큰 금동반가사유상으로 높이가 93.5㎝이다. 1920년대에 경주에서 발견되었다고 전하나 근거가 없으며, 머리에 3면이 둥근 산 모양의 관(冠)을 쓰고 있어서 ‘삼산반가사유상(三山半跏思惟像)’으로도 불린다. 얼굴은 거의 원형에 가까울 정도로 풍만하고 눈두덩과 입가에서 미소를 풍기고 있다. 상체에는 옷을 걸치지 않았고, 목에 2줄의 목걸이가 있을 뿐 아무런 장식이 없다. 왼발은 내려서 작은 연꽃무늬 대좌(臺座)를 밟고 있고, 오른발은 왼쪽 무릎 위에 얹어 놓았다. 왼손으로는 오른 발목을 잡고 오른손은 팔꿈치를 무릎에 얹었으며, 손가락으로 턱을 살며시 괴고 있다. 하반신을 덮은 치맛자락은 매우 얇게 표현하여 신체 굴곡이 잘 드러나며, 연꽃무늬 대좌를 덮은 옷자락은 깊고 자연스럽게 조각되었다. 왼쪽으로 옥을 꿴 치마의 띠가 내려가고 있으며, 머리 뒷부분에는 긴 촉이 달려 있어 광배(光背)를 꽂았음을 알 수 있다. 단순하면서도 균형잡힌 신체 표현과 자연스러우면서도 입체적으로 처리된 옷주름, 분명하게 조각된 눈·코·입의 표현은 정교하게 다듬어진 조각품으로서의 완벽한 주조 기술을 보여준다. 잔잔한 미소에서 느껴지는 반가상의 자비로움은 우수한 종교 조각으로서의 숭고미를 더해준다. 국보 제78호인 금동미륵보살반가사유상보다 연대가 내려와 삼국시대 후기에 만든 것으로 추정된다. As one of the two largest gilt-bronze statues of Buddha in meditation made before the modern period -- the other being the gilt-bronze statue designated as National Treasure No. 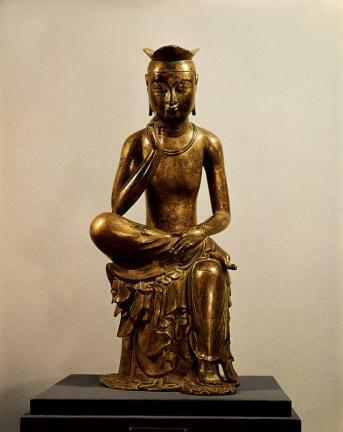 78 and stored in the National Museum of Korea in Seoul -- this pensive Maitreya is 93.5 centimeters tall and was presumed to have been found in Gyeongju during the 1920s. Wearing a crown of three peaks, it is also called the Tri-peak Pensive Buddha. The Buddha has a plump, round face wearing a benign smile and a naked slender upper body with two loose rings around the neck. He is seated with his right leg crossing the left leg -- which is pendent -- on a tiny lotus mat, his right hand placed over the right ankle and the fingers of his right hand gently touching his right cheek. The skirt covering the lower body is as light as a veil that it reveals the shape and curves of the body; the fabric covering the lotus pedestal on which the deity is seated is draped down heavily, creating many folds. His outfit is complete with a fabric sash around the waist and is draped down with a jade disk chained in the middle. There is a peg behind the head, showing that the deity once had a mandorla (Buddhist halo of light). With the simple, balanced body, realistic rendering of the veil skirt and fabric pedestal cover, and elaborately carved facial features, the statue is widely regarded as a clear example of advanced metal molding techniques. The dim, blissful smile on the face also contributes to its reputation as a great masterpiece representing the artistic achievement of Korean Buddhist sculpture. Art historians believe that the statue was made later than the Gilt-bronze Pensive Maitreya Bodhisattva of National Treasure No. 78, probably during the late Three Kingdoms Period (57BC-668).